Here's the 6mmBR.com Guide to the 22BR cartridge and 22BR precision shooting. We cover 22BR case-forming, reloading, .224 bullet selection, cartridge merits, and offer some favorite 22BR load recipes. With a box of Lapua 6mm BR Norma brass, Benchmark or VV N135, and some custom 52gr bullets, you'll be shooting bughole groups at 3600 fps in no time. And with the 40 grainers, varminters can keep pace with 22-250s, with better accuracy to boot. 22BR Cartridge Diagram. The 22BR is a simple wildcat formed by necking-down 6mm BR brass. Case forming is easy--just run a 6BR case through a 22BR sizing die. With custom bullets, the 22BR has done well in NBRSA short-range Benchrest. Accuracy is on a par with 6mm BR out to about 250 yards, but from there, the 6mm VLDs, with their high BCs, buck the wind better. The primary reason to shoot the 22BR vs. the 6BR is the extra velocity available from very light bullets. You can push the 52gr match bullets to 3700 fps and the 40gr Sierras and Noslers past 4000 fps. That kind of speed makes varminters smile--22-250 velocities with less powder and better accuracy. What's not to like? Forming 22BR brass is not complicated. Starting with 6mm BR cases from Norma or Lapua (the latter is our favorite), you simply run the case through a 22BR full-length sizing die. Be sure to outside-chamfer the case mouths first and lube the case necks and body. To reduce run-out, half-way through the stroke back out the case and rotate it a half-turn. Then finish by running the case all the way up into the FL die. You can also use a bushing neck-sizing die, but it goes more smoothly if you use an intermediate bushing, then do a second pass with your final bushing. (Or, if you have a Redding 22BR die, using it first will reduce the neck enough to finish with a single bushing.) Using a full-length sizing die is the better method, as the bushings tend to push brass down to the neck-shoulder junction (NSJ). With either method we suggest you run a mandrel down the necks after necking down, and neck-turn the last .050" or so of the neck and slightly up into the shoulder. This will remove any bulge at the NSJ, and help prevent doughnut formation. And remember to load a few dummy cases before you spec the neck diameter for your reamer to ensure your cases will chamber without further neck-turning. The 22BR works well with the same powders that are popular with the 6mm BR (AA2460, H322, VV N135, Varget) with a bias towards faster-burning powders for the lighter 40-55gr bullets. 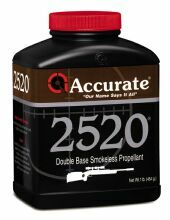 With 52-grain match bullets, Benchmark works very well and many top shooters report great velocities (3850+ fps), with good accuracy using case-filling loads of AA2520. However, AA2520 varies from lot to lot, so start low with each batch. The AA2520 and 50-55gr match bullet combo does appear to be nearly ideal, using the full case capacity. For the heavier 60-75gr bullets, AA2420 offers peak velocities, but it's hard to beat Varget for accuracy and temperature stability. Vihtavuori N135 is a proven performer that excels with a wide variety of bullet weights and it is consistent from lot to lot. Sierra 22BR Load Manual (.pdf download). We aren't seeing any clear preference among primers for the 50gr bullets. Shooters use Fed 205s, CCI BR4s, and Rem 7.5s with equal success. For the 70-80gr bullets, we recommend the CCI 450s. With its great inherent accuracy, the 22BR performs brilliantly with premium custom-made bullets in the 50-60gr weight range. Bart's, Gentner, and Fowler match bullets are all capable of grouping in the 1s in a premium benchrest gun. Prairie-dog hunters seeking max velocity and good accuracy should try the 40gr Nosler Ballistic Tip and Sierra BlitzKing bullets. As all-around varmint projectiles both the 55gr and 60gr V-Max are superb. Shooters love these bullets. They are very accurate, explosive on varmints, and the 60s work well in the wind. 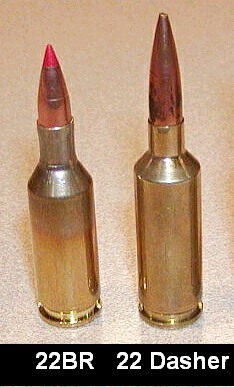 Read these user comments: 55gr V-Max | 60gr V-Max. For hunting larger varmints such as coyotes, the Sierra 65gr GameKing boasts a relatively high BC for its weight, great accuracy, and enhanced penetration. If you plan to campaign a 22BR at 300 yards and beyond, you'll want to use the long, heavy bullets developed for .223 Service Rifle and High-Power Shooters. Sierra, Berger and Nosler all offer 80gr low-drag bullets. Most folks find the Sierra bullets, when sorted, shoot best, though Berger claims a .489 BC vs. .440 for the Nosler "Custom Competition" and .4 for the Sierra 80gr MatchKing. We think the Berger BC is a bit optimistic, so don't hesitate to try all three in a 1:8 or 1:7 twist barrel. The wind-cheating .570 BC 90gr JLK makes for the ultimate 22BR long-range load. Full Report on 90gr JLK in 22BR. Respected shooter and firearms writer, Don Lewis chose the 22BR as one of his "All time TOP FIVE" Varmint cartridges (Varmint Hunter Magazine, Oct 2001), placing the 22BR among the 19 Calhoun, .222, 22-250, 22BR and 6mm BR. One of our readers writes: "I have two rifles in 22 Remington Bench Rest. Both are extremely accurate...with groups in the low 3's. This is with varmint-style bullets and varminting-type scopes. The 22 BR is an efficient and easy-to-make cartridge in my experience. Lots of velocity from relatively small powder charges. I use three brands of BR brass in my BR guns--Remington, Lapua and Norma. All give enviable performance and long case life. As far as forming brass--it is simple and easy .... I simply run 6mm BR brass through the 22 BR die. Nothing could be simpler! I consider the 22 Remington BR cartridge to be one of the three best varminting cartridges of all time. Several of my friends use the 22 BR for Varminting and fun use at their ranges. I highly recommend this cartridge to you. Mild recoil, long case life, inherent accuracy and good velocity with flat trajectory." -- VarmintGuy, from Accurate Reloading Forum, 5/3/04. 35 Berger MEF VV N135 34.0 MAX Rem 7.5 Lapua 6BR .136 4200+ Stick with a slow-twist barrels or jackets may blow at these velocities. Explosive impacts. 40 Sierra BlitzKing H322 32.9 MAX Rem 7.5 Lapua 6BR .196 4100 The 22BR gives up nothing to a 22-250 with this load. 40 Nosler Ballistic Tip AA 2230 34.0 MAX Rem 7.5 Lapua 6BR .221 4050 Wicked fast, effective varmint round to 200 yards. Compressed Load. 40 Nosler Ballistic Tip Bench-mark 32.5 MAX Fed 205M Lapua 6BR .221 4020 "Great accuracy in every 22BR I've worked with"--Al Nyhus. Burns cleaner than H322. 52 BIB Match Bench-mark 31.3 Fed 205M Lapua 6BR .221 3650 "Sub .250 groups are the norm with this combo"--Al Nyhus. 52 Fowler Match AA 2520 33.7 MAX Rem 7.5 Lapua 6BR n/a 3850+ Very high velocity, great accuracy. An awesome load. But big lot to lot variances, so always start low. 52 Gentner Match H322 29.6 MAX Rem 7.5 Lapua 6BR n/a 3600 "With the Gentner 52s, this load has shot low 1s in a rail gun." VV N135 also extremely accurate. 52 Berger HP AA 2460 31.5 Win SR Lapua 6BR .237 3550 Accuracy load that has worked in many guns. 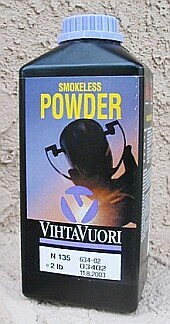 Not too hot; you can go faster with this powder. V-Max Varget 32.5 Fed 205M Lapua Std .255 3600 "Incredibly accurate...best with Varget at 3500-3600 fps." V-Max H322 28.4 MAX Fed 205M Lapua Std .265 3400 "60 V-Max is the hardest hitting prairie dog bullet I have ever used." 65 Sierra GameKing IMR 4895 29.0 Fed 205M Lapua Std .303 3300 "Hunting bullet that shoots with the accuracy of a match bullet". 69 Sierra MatchKing Reloader 15 31.5 Fed 205M Lapua Std .301 3460 Super Accurate in 9-twist--0.375" 10-shot 100m groups. A-Max Varget 29.5 MAX Rem 7.5 Lapua Std .435 3150 A nice 300m load with excellent accuracy and good BC. 80 Sierra MatchKing H4350 31.5 Fed 205M Lapua 6BR .420 3150 Very accurate at this velocity, and you can push it a bit more. 90 Jimmy Knox VLD VV N550 31.3 MAX CCI 450 Lapua 6BR .570 3050 FPS in 30" 1:6.5 twist. N550 needs close to max load. Varget works well at lower pressures. Velocities are based on a 26" barrel and standard 6mmBR Norma case. Note, velocities may vary considerably from gun to gun, and even barrel to barrel. Primer brand will also alter velocities. Always start 10% low and work up. WARNING: ALWAYS start 10% below these loads and work up. Lot variances with fast-burning powders can be extreme. Whenever you buy new powder, even the same brand, start 10% low. NEVER assume pressures will be safe if you change lots or ANY component. Case web growth is probably the most reliable indicator of over-charge. By the time you're getting stiff bolt lift or cratered primers with fresh brass you've exceeded proper pressure levels. Ambient temperatures and seating depth can alter pressures considerably. Don't assume cold weather loads are safe in summer.